Halloween isn’t just meant to be a fun and spooky day for kids and young adults. People over 65 can still enjoy the holiday and gain a few health benefits in the process. 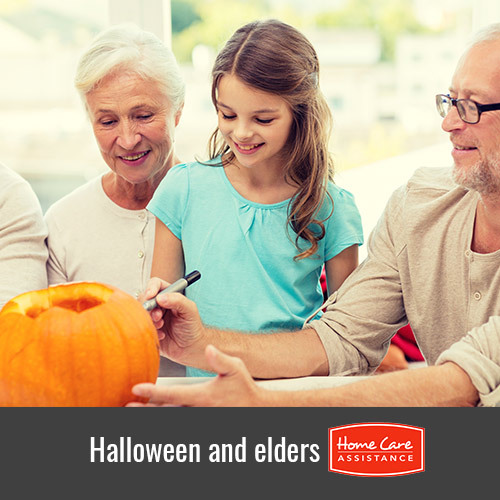 The Harrisburg, PA, elder care experts at Home Care Assistance list some of the fun ways your elderly loved one can get into the Halloween spirit this year. Participating in a scavenger hunt can boost your loved one’s memory and increase his or her self-confidence and socialization skills. The hunt will require physical activity, which can lower your loved one’s cholesterol and help him or her maintain a healthy weight. Leave clues and Halloween-themed treasures around the home and yard for your loved one to find, and encourage the grandkids and local trick-or-treaters to participate as well. After your loved one has carved out the pumpkin, he or she can get creative and paint it. Painting can help engage your loved one psychologically and cognitively. Your loved one will be using parts of the brain he or she she may not normally use. Exercising the brain through creativity is a great way to keep the brain strong and alert, and painting can also give your loved one a feeling of self worth and a more positive outlook on aging. You can throw a costume party for your loved one and his or her friends or take him or her to a community Halloween party. A craft party is another themed event you can put together to help your loved one remain social. A themed party can help boost your loved one’s overall wellbeing and reduce the risk of depression and anxiety. Choose a few horror and Halloween-related comedy films for your loved one to watch. If he or she has any Halloween favorites, make sure those movies are a part of the marathon. You can start the marathon a few days prior to Halloween or just watch a few movies on the actual holiday. Watching these movies can help alleviate stress and enhance your loved one’s emotional health. Your loved one can relax and watch the films, reducing the risk of heart attacks, strokes, and other serious conditions caused by stress. Don’t wait for Halloween or other holidays to encourage your loved one to get physically, mentally, and emotionally engaged. Reach out to Home Care Assistance today to learn how our dedicated caregivers can enhance his or her quality of life. In addition to live-in and respite care, we also offer specialized Parkinson’s, post-stroke, and dementia care Harrisburg, PA, seniors can rely on. For more information and to schedule a free in-home consultation, please call (717) 540-4663 today.